sailboat. : Monday Lust List 009. I really like that lip colour! Might have to grab me one of those. I think you may be Mont Blanc in Nars Sheer Glow, it's quite pale but yellow toned. I love that rabbit hottie! Too cute. We need to get a hot water bottle for the new puppy to help him sleep at night and I can just see him cuddled up to this! Also love that Yumi blouse - you can't go wrong with a sausage dog print! That lipstick is such a pretty colour, I know what you mean about how a great new lipstick colour can totally transform your look or an outfit. The sausage dog ring is adorable too. You did well in not getting the Nars trio, it's not very pigmented and the colors aren't very different from each other once applied. However, totally go for Nars Sheer Glow! We have a lot of common taste in foundations from what you wrote in the past, and we do wear the same color so I can tell you that Gobi will be ok. It's one of my 2 favorite foundations ever. The other one is Chanel Vitalumiere Aqua in B10 but the color isn't as good of a match as Gobi is. The little sausage dog ring is so cute! I looked at a key one the other day that went across two fingers, but I can never decide if it'd annoy me/get in the way or not? That dress is so lovely though, fab for Christmas/New Years parties, Matalan get some great things in every now and then! I've never tried Nars, I think I need to! Also need to pop into Toppers and have a look at their new make up range! I loove all your picks! I love sausage dogs too, my boyfriend's brother has one, she's called Mimi and is adorable! I would really recommend visiting a counter for foundation if you can-I've just invested in an Estee Lauder one after years of using cheaper versions and I can't believe a) the colourmatch [better than anything I've tried to match myself, I guess because a trained makeup artist will be able to look at your skin without pre-concieved ideas of shade-I always pick shades darker than my skin actually is] and b) how much BETTER I look as a result! Well worth a visit if you can! loving the necklaces but at a loss when it would come to picking a colour - theyre all so lovely! probably go with the green - how about you? I love Nars & can thoroughly recommend their blusher. their products last for ages as well which is a bonus. 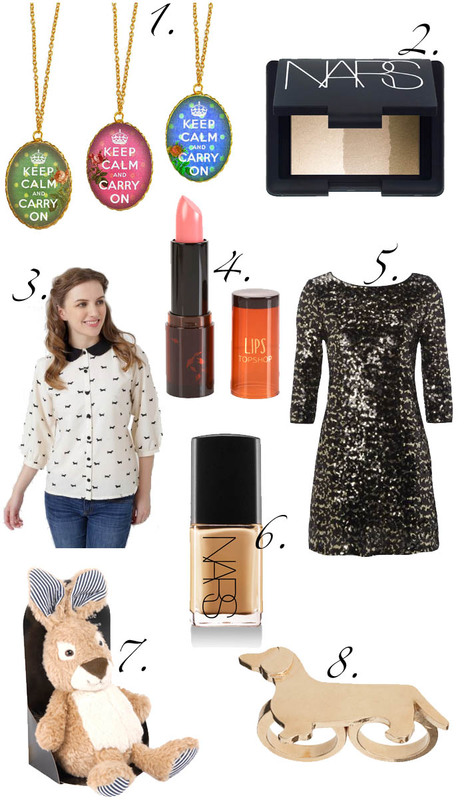 I would never hace thought the sequin dress was from Matalan, it is stunning & perfect for the party season. also loving the yumi blouse - cute & quirky!